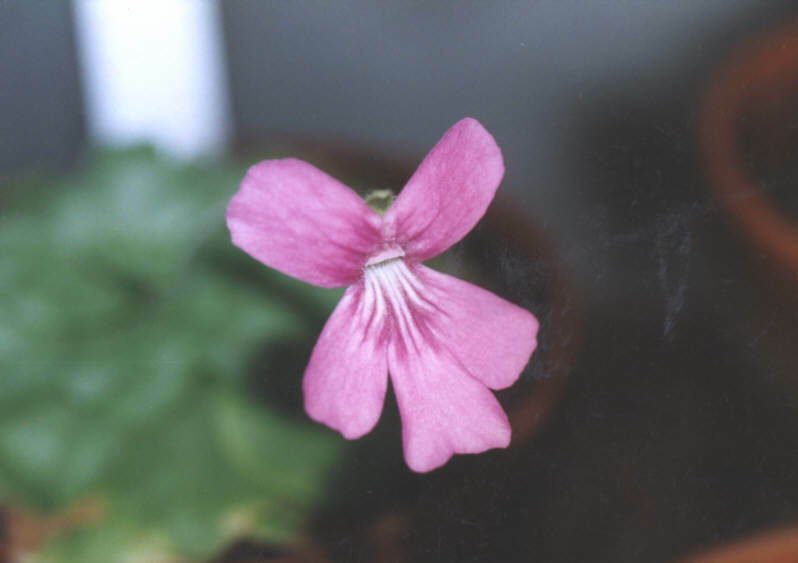 The plant was collected in Mexico by Omer de Malzinne and brought back to Edouard Morren for description. From Paso del Macho, in Vera Cruz, Mexico. Click on the graph to enlarge and see graph of normal precipitation and normal average temperature. Normal values are 30-year averages for the period 1961 to 1990. The weather stations are grouped by region (see map of weather stations). No data. I found this plant in J.J. LABAT collection (manager of the famous French carnivorous plants Nursery "Nature et Paysage"). 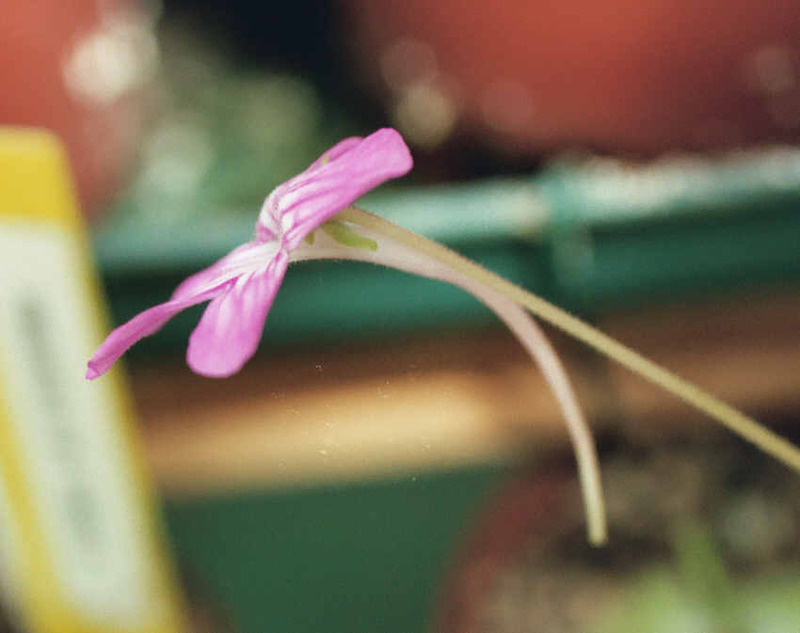 Life cycle : The life cycle of this Pinguicula from Mexico has two seasons, one wet and the other dry (see link). The leaf rosettes of the plant are different according to the season. 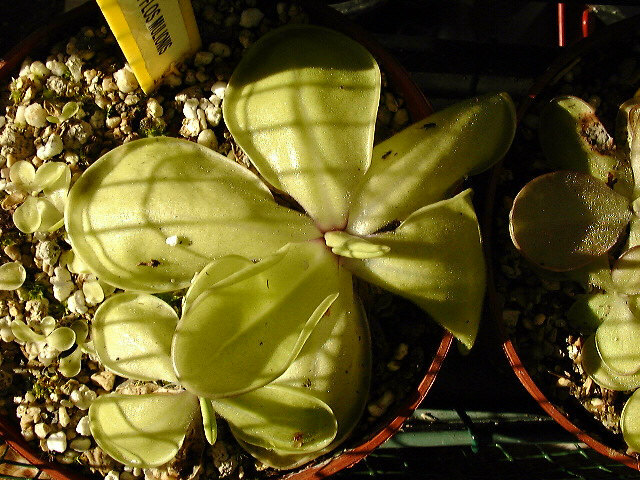 During the resting months (winter) the plant develops a small succulent rosette made of numerous non-carnivorous leaves. 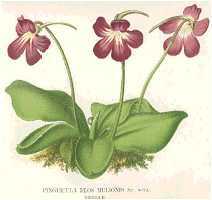 The carnivorous leaves are produced in spring and during all summer growth. The life cycle of the plant is probably similar in it's native habitat but I have no data. Media: I use a 100 % mineral media : 2 perlite, 2 vermiculite, 1 small sand (for aquarium), 1 fine white sand, 1 pouzzolane (volcanic lava), 1 aqualit (expansed ceramic for aquarium). The aqualit can be replaced by 1 of pouzzolane. 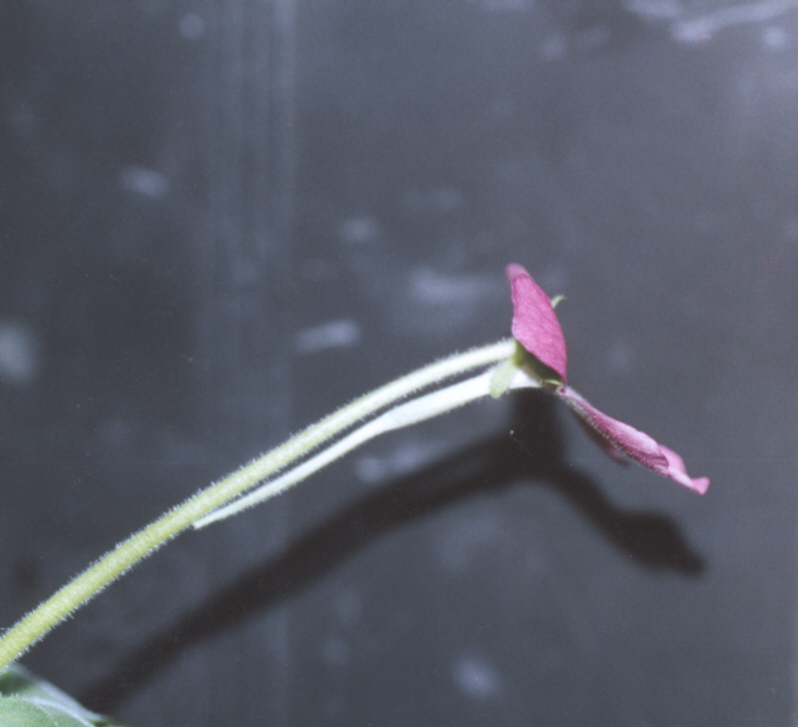 In such a media, plants grow slightly slower but have a stronger root system. Cultivation : I think that it is important to have an airy situation in the greenhouse. To avoid air stagnation, I use a fan 24h/24h all the year round. Watering is also very important : from May to September (summer), I let the media drying slightly between two watering. I am watering from above the pot using rain water. Always avoid wetting the rosette. From October to April, It is important to keep the pot dry. Atmospheric humidity is around 80%. The mentioned months are indicative and can change according to your own growing conditions. In fact, when this Pinguicula begins to produce its non-carnivorous leaves, you have to stop watering and let the pot to dry out. Inversely, when the plant begins to produce in early spring its carnivorous leaves, you have to progressively start watering again the pot. Temperatures : during growth, day temperature is about 25°C but can reach 35°C when the sun is shining on the greenhouse despite the use of shading covers. Night temperature is around 20°C. During resting : day/night temperatures over freezing point. The lower temperature observed was - 4°C. I use an electronic petroleum heater. Flowering period : not yet. Multiplication : I have never had flowers yet. So I don't know if the pollinization could give seeds. The plants can be propagated easily using non-carnivorous leaves separated from the rosette at the end of winter. You only have to carefully tear out all the leaf particularly with the white base. The cuttings will come from this area. Don't try with the summer leaves, it is harder. 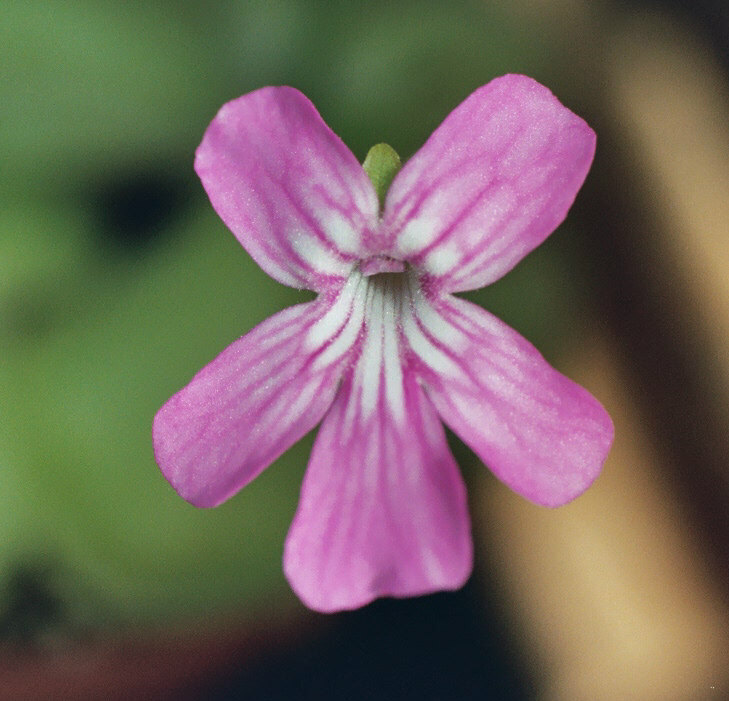 Pinguicula hemiepiphytica, close-up of the flower. Pinguicula hemiepiphytica, close-up of the flower, note the funnelform of the corolla-tube.